This is one of the projects that I had started while I was in the Okanagan (I promise that I'll give it its own post soon!). I've been knitting on it off and on, mainly when I need a break from the thin yarn of Georgia. So far it's been a fairly simple knit yet interesting enough with all the cable work involved, which reminds me of how much I love cabling. Why don't I do more projects with cables in them? Well, for the past few days I've only been working on Georgia while on breaks at work and have been knitting up this new project when at home...mainly at night. Maybe I should stop doing that and wait until either Georgia is finished or until I'm more awake to pay attention to what I'm doing. Why? See that there? Yeah, that's a mis-crossed cable. Pretty much at the beginning of the cable chart. I'm glad that I caught sight of this as early as I did. 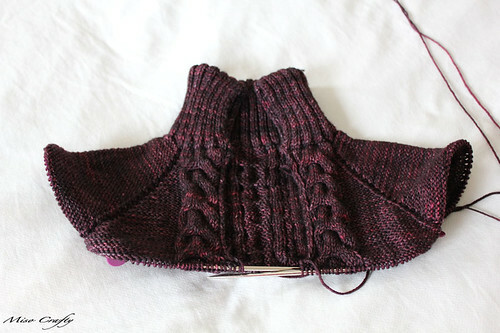 Can you imagine having knitting up an entire cardigan and then discovering this just as you're binding off the last few stitches of the hem? Just wish I had caught this oh, 30 rows ago or so. But coulda, shoulda, woulda. Right? OK, I'm going to enjoy another cup of coffee - maybe some tea, take a few really deep breaths, and figure out my plan of attack. I know for sure I can't leave this as is as it'll drive me up the wall every time I wear or even look at this garment, which will then turn into me not wearing it at all and there goes 40-50+ hours of work...all for a pile of yarn that's collecting dust somewhere in the house. I second Jennifer! I once did all my cables the wrong direction on a sleeve, and I dropped ALL of them instead of ripping back. 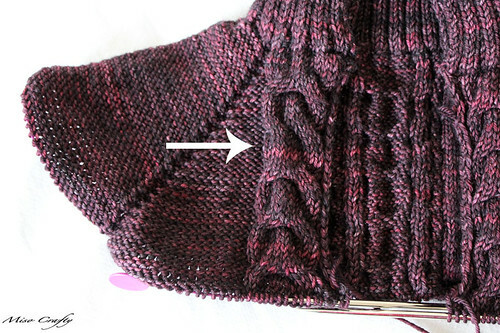 Leave your project on the needles, and use dpns for the part your dropping - I can show you on Friday if you like - it's not too hard, and it sure beats redoing the whole thing! Thanks for the vote of confidence ladies!! All's good in the hood now! Phew!!! Natalie, thanks for the offer! But waiting 'til Friday to fix that would've drove me nuts...just knowing that mistake was there, staring at me...grrr! !